In this space for 2016 team previews, I generally recap 2015. And I'm only going to do that quickly for the White Sox because of the odd story surrounding this team that overwhelmed the news cycle this spring for a while. Chicago was very active last offseason in landing the likes of Jeff Samardzija, Melky Cabrera and closer David Robertson. I thought the Sox would contend in the AL Central, but they flopped with a 76-86 record that was better than only Detroit in the division. I was a bit surprised that Manager Robin Ventura was kept, but he remains a favorite of owner Jerry Reinsdorf from his playing days in Chicago and there simply is no more loyal owner in baseball than Reinsdorf. Speaking of that loyalty, it brings me to team president Kenny Williams. I'm sure by now you know all about the Adam LaRoche issue, where Williams told his first baseman/DH that LaRoche's 14-year-old kid Drake couldn't be around the team every single day. By some reports, he had been with the club at least 120 games last year, meaning he obviously traveled with the Sox at times. He had his own locker next to dad at home as well as this spring in Arizona. Drake had been there every single day this spring, taking drills, in the clubhouse, traveling on buses -- the LaRoches are doing a version of home-schooling for Drake. Of course, LaRoche, in the final year of his contract, took umbrage with Williams' request and opted to walk away from $13 million. I can't not give my opinion here. Williams was totally in the right. No kid should be in an adult workplace 100 percent of the time. Why isn't Drake in school around kids his own age? Sure, baseball has a history of letting children in the clubhouse, etc., but there's a certain line. And all Williams asked was that LaRoche dial it back to about 50 percent of the time. Totally reasonable request. Kudos to LaRoche for sticking to his principles, but what is he teaching his kid about quitting on your teammates? Here's where things get interesting. Predictably, all the players backed LaRoche and said they loved having Drake around. Yet a USA Today report said some players and staffers had complained to the front office. So Williams might have taken a bullet for GM Rick Hahn and Ventura. Ace Chris Sale totally ripped Williams publicly, saying he flat-out lied for his reasons of limiting Drake's time with the team. Sale basically told Williams to stay the F*** out of clubhouse matters. This whole episode is why no team is going to be more interesting the first few weeks of the season than the White Sox. They could pull together in their anger at Williams and become a better team -- those 1970s Yankees clubs under Billy Martin were always at war with Martin or the front office but they won. Or Chicago could struggle at first and implode internally, forcing Hahn to dump Ventura. Williams isn't going anywhere as Reinsdorf has backed the guy who won him a World Series in 2005 when Williams was the GM. One thing you have to respect about the White Sox is they never full-blown tank like the crosstown Cubs did for a few seasons when Theo Epstein got there. The Sox live in the shadows of the Cubs as it is so they always try to win. This offseason was no different. LaRoche probably won't be missed much even though he was penciled in as the nearly every-day DH. He hit just .207 with 12 homers and 44 RBIs last year. The Sox certainly would have spent his $13 million somewhere else had there been any good free agents on the market left when LaRoche took his ball and went home. Thus, it's a good thing that the White Sox signed outfielder Austin Jackson to a deal early this month. Now he's going to play every day. Hahn's two biggest offseason acquisitions were trades for Brett Lawrie and Todd Frazier. Hahn had to do something with a lineup that ranked just 28th in runs and 26th in homers despite playing 81 games a year in hitter-friendly U.S. Cellular Field. So with the late addition of Jackson and LaRoche's departure, this lineup is still a bit in flux. The top five seem set: leadoff hitter Adam Eaton (.287, 14 HRs, 56 RBIs, 18 steals) moves from center field to left, which is better for him defensively and should help him avoid injuries, which have plagued Eaton in the past with his all-out style in center. He will be followed by Lawrie, who hit .260 with 16 HRs and 60 RBIs last year with Oakland and moves to second base; that position was an offensive black hole for Chicago. The Sox's best every-day player by far remains first baseman and No. 3 hitter Jose Abreu (.290, 30 HRs, 101 RBIs), who perhaps regressed ever so slightly from his amazing rookie season but was still excellent. Frazier will hit cleanup and is at third base. It cost the Sox some of their better prospects to land Frazier from the Reds in a three-team deal. Frazier hit .255 with 35 HRs and 89 RBIs in Cincinnati last year but struggled in the second half after winning the Home Run Derby. Cabrera (.273, 12 HR, 77 RBIs) did hit much better in the second half and will move from left to DH. Things get a little unclear at this point. Jackson could hit sixth and will play center. He hit .267 with nine homers, 48 RBIs and 15 steals with Seattle and the Cubs last year. 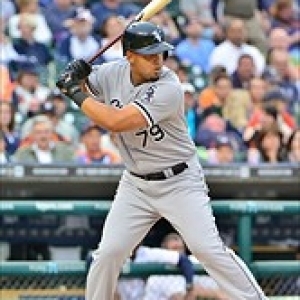 Avisail Garcia (.257, 13 HRs, 59 RBIs) has been a disappointment so far but is hitting this spring. He may hit seventh and play right, although also DH at times. The catcher platoon of Alex Avila and Dioner Navarro will hit eighth and then veteran shortstop Jimmy Rollins ninth. Rollins was originally signed to a minor-league deal at the start of camp but will win that job over Tyler Saladino. Be aware that Chicago's top prospect is shortstop Tim Anderson, so he could factor here later in the season if Rollins is clearly done. This lineup will definitely be better. Still pretty weak at short and catcher, however. But the Sox do have that $13 million to potentially make an in-season upgrade. Samardzjia left in free agency, but he was terrible in 2015 in leading MLB in earned runs. This should be the most left-handed rotation in the majors, although the Dodgers could also have four lefties if they ever get everyone healthy. It all starts with the incomparable Sale (13-11, 3.41 ERA, 274 Ks). That ERA was actually the worst of his career, but also consider that the Sox had perhaps the majors' worst defense behind him and that's much better now all over the place. Sale's strikeout rate has improved every season. He's the definition of an ace. While teams always call about Sale and the Sox always say no, they also inquire about Jose Quintana (9-10, 3.36 ERA), still one of the most underrated starters in baseball. It wouldn't shock me if Quintana was dealt this season for young hitting if the Sox struggle early. Arguably the key to this season is Carlos Rodon, who was 9-6 with a 3.75 ERA as a rookie and has one of the most devastating sliders in the majors. He was dominant at the end of last year, going 5-2 with a 1.81 ERA in his last eight starts. The one worry with him is control. John Danks (7-15, 4.71) is thankfully in the last year of his huge deal but actually has been quite good this spring. And your lone righty is reclamation project Mat Latos (4-10, 4.95 ERA). He's on a one-year, low-cost deal that's worth the risk. The bullpen is just OK as Robertson blew seven saves last season but did have 34 of them and a 3.41 ERA. At BetOnline , Chicago is +3300 to win the World Series, +1600 for the AL pennant, +500 in the AL Central and has an "over/under" wins total of 81.5, with both options at -115. Abreu is +3300 to lead the majors in homers and +2500 to win AL MVP. He has a homers total of 30.5. Frazier is +4000 for MVP and has a homers total of 26.5. Sale is the +300 favorite for AL Cy Young and has a wins total of 13.5. FanGraphs projects Chicago to finish 80-82 and third in the AL Central, seven games behind Cleveland. USA Today has this team winning 90 games and the division. That's not impossible to see. Neither is 76 and last. That's the AL Central for you this year. Not ready to predict a division title but go over the wins, over Sale's wins, under Abreu's dingers (barely) but over Frazier's. If the Sox do win the Central, then that probably means Sale is your AL Cy Young. He's due one.